Too busy to make your own green juice? Well guess what??? 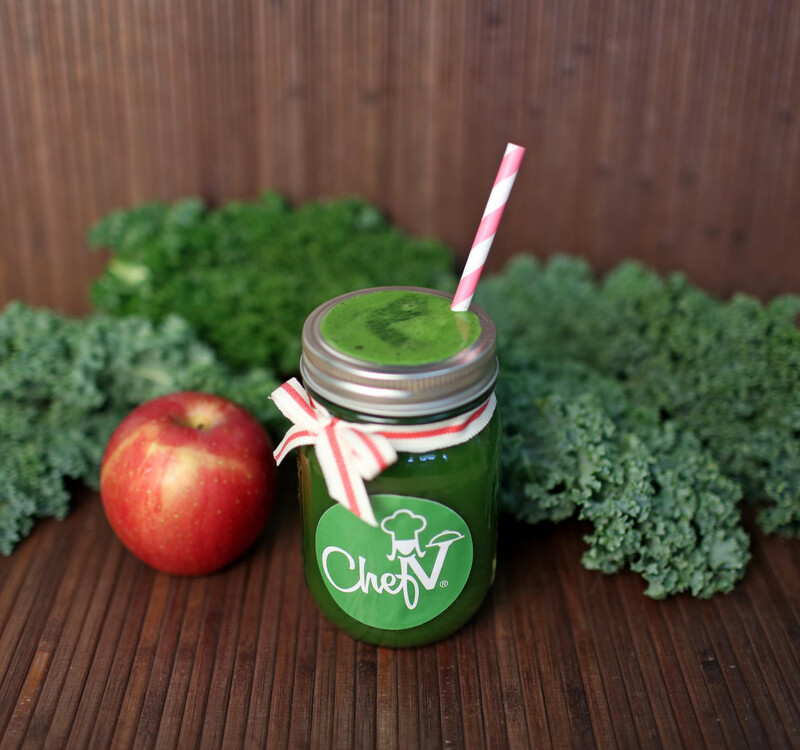 Chef V can provide you with fresh, organic green juice delivered to your door! Chef V provides a convenient way to get fresh, organic Green Drinks and Cleanses without the fuss, clean up and added expenses of doing it yourself! It has a fraction of the sugar found in store-bought green smoothies. Perfect to keep up great nutrition when you’re always on the go! And it tastes great too! Chef V proudly serves areas in California, New York, New Jersey, Maryland, Massachusetts, Pennsylvania, Virginia, and Washington, D.C. I love drinking green juice. Normally I would make it myself, 4-5 times a week, assuming I made sure to have fresh greens prepped and ready to go in my fridge. If I got busy, I often forgot and sometimes, I just wasn’t willing to spare the time to make some. Having it on hand was a really great experience! Not only did I drink it every day, but I drank it THREE times a day! I was skeptical about whether I would actually feel a difference, but I can honestly say I did. By mid week, I would not really craving sweets that much, I wasn’t really thinking about snacking and I had more energy than usual. Its the first time I can remember in awhile where I didn’t wish for a nap in the afternoon. Since then, I don’t find myself craving sweets nearly as much. I feel more satisfied when I eat and seem to snack less. On the fifth day, I woke at 4am with a severe sinus headache. We experienced high winds for a couple of days and I just knew this was coming. By midday, it was so bad that it turned into a migraine and nothing was helping relieve the pain. I was sipping water, making myself eat a bite here and there, throughout the day, but the headache was making me nauseous. By 3, I couldn’t take it anymore. I drank two servings of the green juice. I kid you not – in less than an hour, my headache started to fade. And in the next hour, it completely disappeared! I don’t know if it was coincidence or not, but all I know is that the water, green tea and ibuprofen I took did nothing to relieve my headache that day. It had me wondering whether the nutrients in my green juice had been my saving grace. My kids drink smoothies almost every day. They only like fruit smoothies and though they are great vegetable eaters, they will NOT try any green juice. Since they are on a blueberry smoothie kick lately, I decided to add some of my green juice in place of the water since I knew it they wouldn’t be able to see a color change. Normally if you add greens to a strawberry smoothie, it will turn kind of a brownish color. When they see this, its all over! Not this time! They drank it and were never the wiser. I was happy knowing they were getting the added nutrition. Add all ingredients to your Vitamix (or blender) and blend until smooth. Receiving Chef V’s Organic Green Drink is as easy as signing up on the website (www.chefvnyc.com) with one of the serviced cities and the customer’s drop-off location. Within seven days from placing an order, one gallon of Chef V’s Green Drink will be delivered to the desired location, straight from the Chef V kitchen by a professional team of delivery drivers. Try the Green Drink, risk-free for 1 week! For more info on Green Drink, Cleanses, her NEW 21-Day Challenge, please visit www.chefv.com! 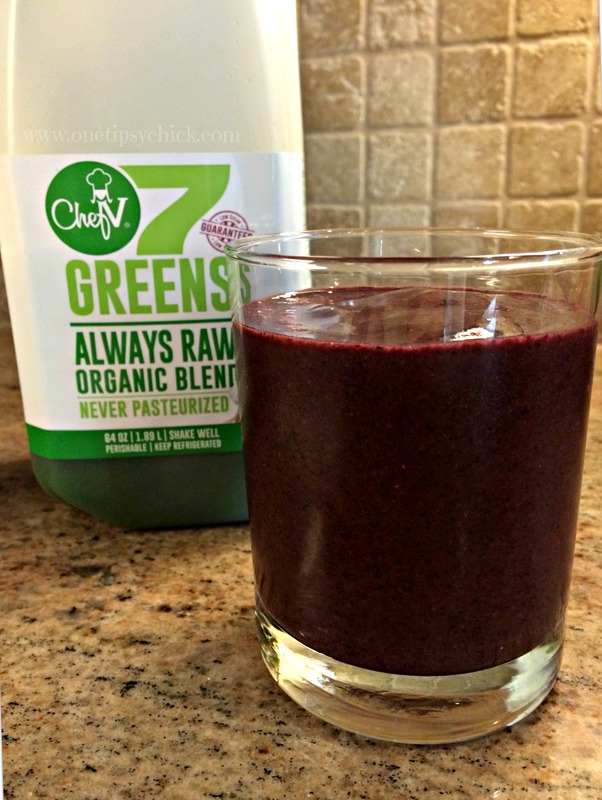 I think I could be tricked with a “green” blueberry smoothie…Yum. That’s great about your headache going away. Interesting! I signed up for the free week! !